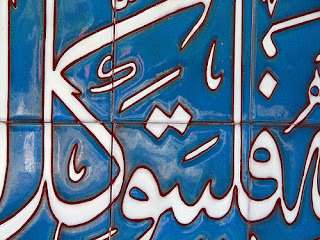 In Arabic, all word forms are derived from their respective root, giving the language complexity and beauty. When I think of a linguistic root, I think back to High School and the SATs. Like many of my peers, I struggled to memorize vocabulary to prepare for the Analogies section. As I labored with flash cards, friends of mine took the short cut, studying the Latin and Greek roots of many English words. To them, the clusters of letters shared by different words were clues to their meanings. If, by exam day, you hadn't memorized Ichthyology but knew that it was formed by the Greek root words ichthus, meaning fish, and logia, meaning the study of a certain subject, then you could confidently guess its meaning: the study of fish. Roots like these influence many English words, and play bigger roles in other languages. Latin roots are shared between Spanish, French, and the other Romance languages. But none of these share as Arabic's and its Semitic cousins' dependence on a root system. Today, we're going to talk about the root system and how it is the key to deciphering an Arabic word's true and full meaning. First, what is a root? A root is the simplest, most reduced form of a word in Arabic. Arab linguists call this the mujarrad مجرّد, or 'bare', 'naked' form of a word. Most roots are either triliteral, meaning they are composed of three letters, or quadriliteral, composed of four. The mujarrad is the base from which all other words are derived. These three- and four-letter roots are modified with suffixes, prefixes and otherwise to create the expansive variety of nouns, verbs and adjectives that make up Arabic's lexicon. Words from the same root often have similar meanings. To see this, and how meanings change based on a word's form, we'll look at the root kataba. Kataba can be modified to create different forms that have different, associated meetings. By adding an alif after the kaf we create katib which means 'writer', the active participle of 'to write'. By adding a mim in front of the Kaf and a waw between the ta and the ba we create maktub which means 'written', the passive participle. Because kataba means to write, a maktab is a place where writing takes place. So we translate maktab as 'office' or even 'desk'. The patterns shown in these examples are paradigmatic for particular nouns and participles. For example, active participles in the mujarrad follow the same pattern as katib كاتب. So someone who is going somewhere is dhahib ذاهب from dhahaba ذهب, 'to go'. The same is true for passive participles, nouns of places and dozens of other of words. As you can imagine, learning the root system and its patterns is absolutely essential to fully understanding Arabic as a language. In fact, morphology, the study of word forms, is its own branch of Arabic grammar called sarf. It covers everything from the correct conjugation of verbs to the patterns you use to build words, ranging from active participles to instruments, that embody a root's meaning. The variety of patterns makes Arabic's root system very complex. This complexity, while intimidating to students, also creates splendid beauty. The way a root's meaning modulates over various patterns is sublime. As we'll soon see, exploring the subtle, clever fluctuations in meaning between forms can even be enlightening. 1. With respect to meaning, the mujarrad form looks identical to the 3rd person perfect form of a given verb, but we'll define it as the infinitive for the sake of explanation. MATT SCHUMANN YOU ARE SO FANCY!! I hope this comment doesn't ruin the sophisticated fanciness of your blog. This is awesome and I am so impressed! This is my first time on your blog. I have been studying Arabic by myself for the past 6 months. Why is it that some people say the present tense of the verb "to love" is "uhibbu" and others say "ahibbu". One text I am reading states that there are hardly any verbs which begin with damma as the first vowel so I think "ahibbu" is correct. Am I right? Thanks.